I fully admit that part of the reason I became such a fan of food blogs (of blogs in general) was sheer voyeurism. I love seeing into other people’s lives. Trying to figure out if I’m normal, speculating if I’d die of boredom if I were a product-shilling blogger (note: this previously said “stay at home mother” instead of blogger- SO DID NOT MEAN TO BASH THE MAMAS OUT THERE! I was thinking of a particular breed of food bloggers who do nothing all day and I phrased it super thoughtlessly). To that end, one of my favorites is when bloggers go through their whole day. Apologies in advance if some of the work stuff is a little arcane. Wake up. 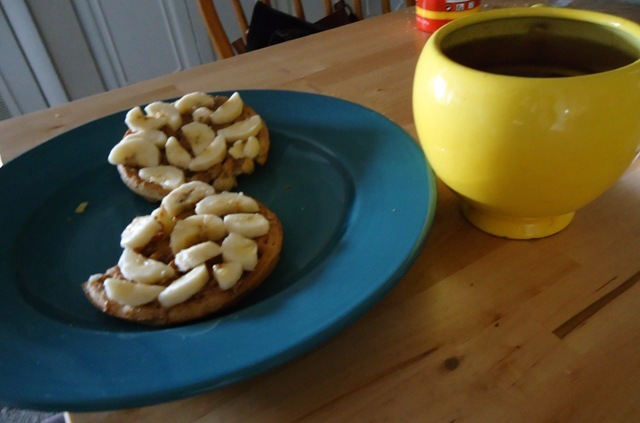 New favorite breakfast, which is two toasted multigrain waffles with almond butter (or whatever butter) and bananas. And tea (whatever caffeinated I feel like; I have like seven kinds- seriously, not an exaggeration- at any given moment). My current conundrum is this: the Food Lion, extremely close to me, sells frozen multigrain waffles. The Trader Joe’s, not extremely close, does too. The TJ’s ones are absolutely fantastic- buttermilky and fresh tasting within, crunchy on the outside. They are also a lot bigger than the Food Lion ones, which is actually problem number one- more calories, take more time to toast, get fewer in a package so I have to buy them more often if I continue to eat a serving of two waffles. Tricky. Also, white whine. Next I take the (awesomely) free Chapel Hill transit to work. 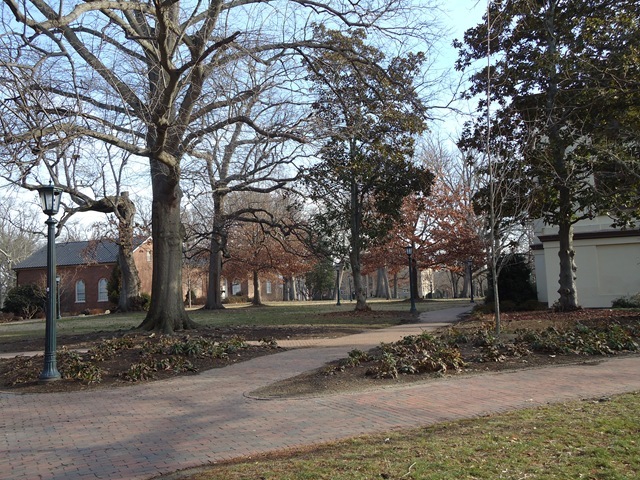 I work on the UNC campus, and one of my favorite parts of my day is walking the short route from where the bus drops me off to where I work. 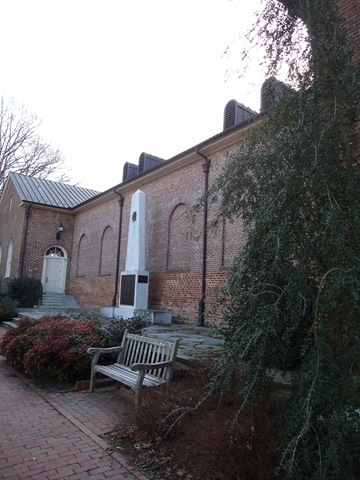 My office is in a cool old building (sweet!) in a slightly weird old room (less sweet) with a ton of natural light (sweet!). 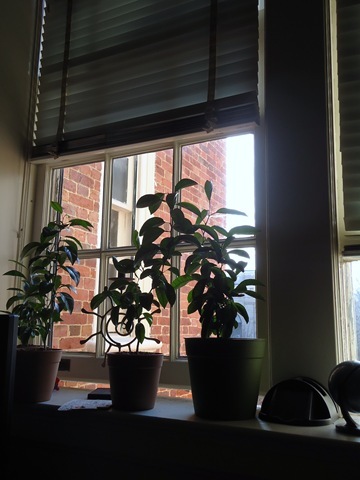 We keep plants on the windowsill. It’s lovely. Now it’s work time. Throughout the morning, I: hear from one of the teachers we sound out to schools is out sick, and search for a sub for her; discover our website has a blurb about a “pdjunct” professor so politely email my boss about the typo, edit a letter for the introduction to a set of educational materials we’re preparing to train afterschool teachers; post a job opening for a teacher to a bunch of listserves. Then, I edited a Rube Goldberg lesson plan, also going into the set of educational materials for informal science teachers in the community. This involves differentiating the activity for different age groups, and finding North Carolina science standards with which the lesson aligns. I will add that this day I documented everything I did was Bob Marley’s birthday. If you have my boss, that means trying to focus while Bob Marley blasts through the shared office all day. Then I get to put out a fire of unpleasantness when I discovered drama going on at one of the schools where we send teachers. Deal with that crisis for awhile. Meanwhile, however, one of my rock star teachers says he can fill in for the missing teacher! Score. Time for a tea break. I keep a tea stash in my office, too. I was serious about the tea thing. 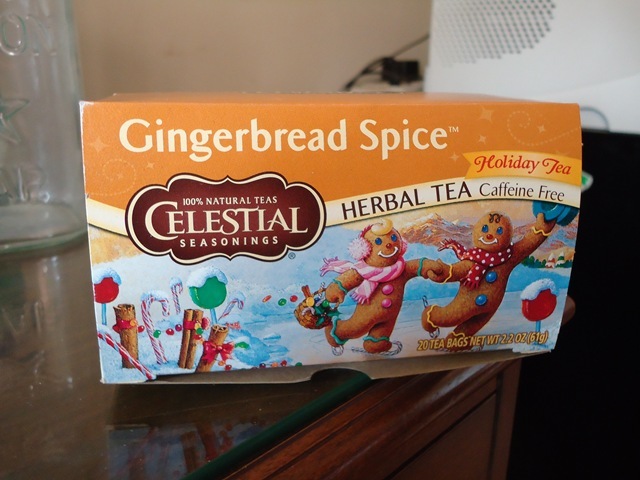 Note: this tea will make your whole office smell good. My coworker is doing a lesson plan for his elementary students about blood. I decide my middle school students would love it too. I start adapting it… then make a slight sidetrack to read the teacher blog from whence had come the lesson plan because it was good and I thought I could pick up on more stuff. That led to doing a little research about what doing a genius hour with our students could entail. More blood blood blood! I got frustrated because in the lesson about mixing together different blood types INSERT SCIENCE GEEK TANGENT FEEL FREE TO SKIP TO THE NEXT PARAGRAPH you make type A with red food coloring, water, and milk; and type B with red food coloring, water, and vinegar; so when you mix types A and B you see agglutination, which is medically accurate. BUT you just make type O by mixing water and red food coloring, BUT TYPE O AGGLUTINATES WHEN YOU ADD A OR B TO IT. (I spent a lot of time frustratedly trying to figure out how to properly mimic nature, barring using actual blood, which I think middle school teachers would have an aneurysm about). Time for a quick diversion from my coworker. 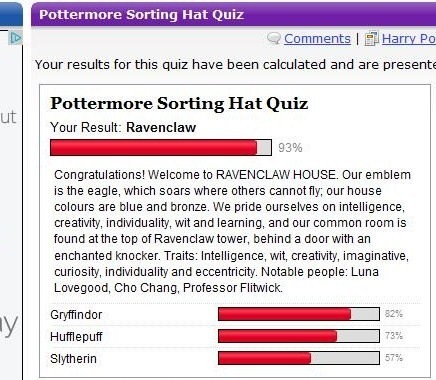 http://www.gotoquiz.com/pottermore_sorting_hat_quiz_2. Decide that some fresh fuel for my brain would help me wake up. Big bowl of random leftover sushi ingredients and a greek yogurt. 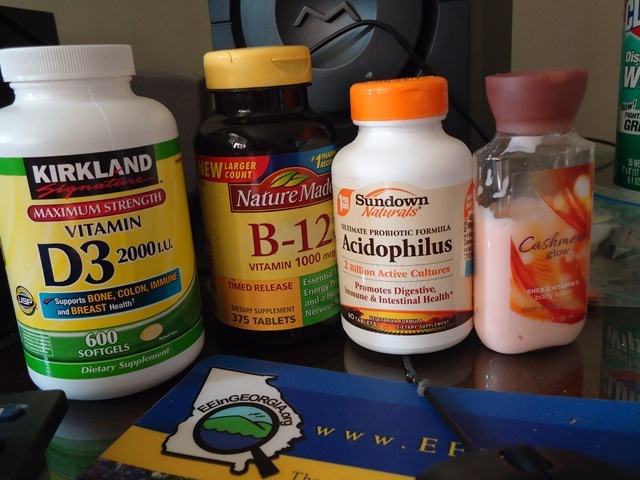 I’ve come up with the (brilliant to me, obvious to others) realization that I perpetually forget to take vitamins at home. 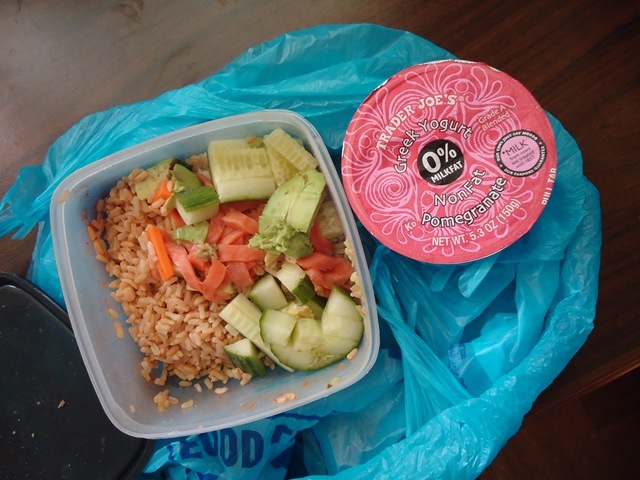 Thus, I have stashed them in my office, and have been taking them faithfully every day with lunch. I also keep my hand lotion at work, since I also perpetually forget to moisturize at home. 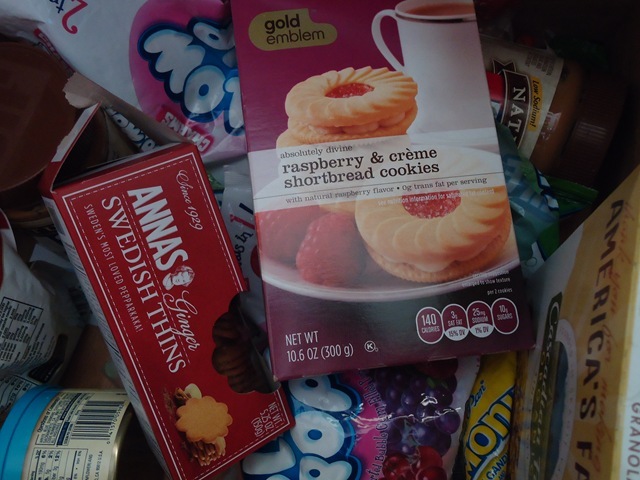 Now that I’ve given the impression of being healthy, let me confess that I make the occasional guilty convenience store run for cookies. In my defense, I inherited the desk of someone with a junk food drawer. 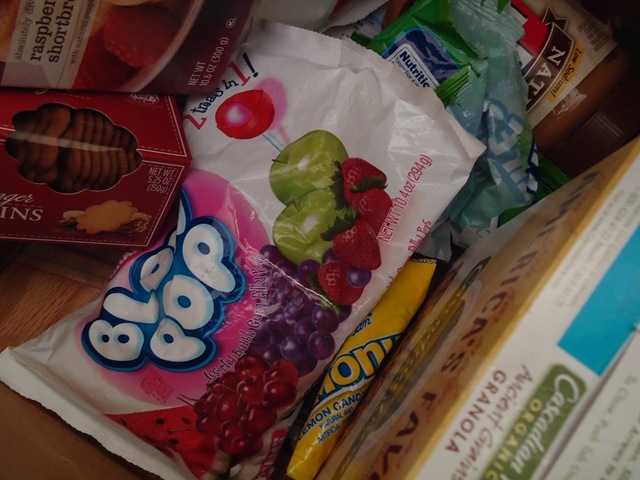 I was afraid that eating daily blow pops (and I really don’t even like lollipops much) would rot my teeth. If there is sugar in front of me, I eat it unless I have a viable alternative. Next, I drink more tea. I’m going to let you infer how many subsequent bathroom breaks follow these tea breaks. There are many. I share an office with two men whom I think I bewilder. An ominous email arrives from buildings staff. I have to send out mass email to our teachers to make sure they’re putting their materials away properly in the basement. Then have to go clean the basement. 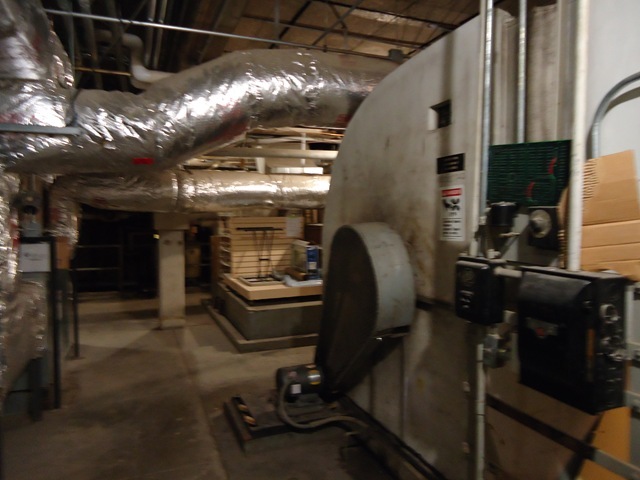 This is not fun, since in the basement I typically feel like I’m going to get murdered, likely by ghosts. I send out some gentle reminders on basement cleanliness. Note: the basement is totally cleaner now, so some of the daily tasks in this email have become pleasantly obsolete. My coworker had gotten me all excited earlier in the day, announcing that he had “a meeting with the butterfly people”. Yes, there is a lab on campus that is all about butterfly research. It’s pretty great. I’m hoping to partner with them. I totally crashed his meeting.Then I took a nice chunk of time doing frenetic research of scientists we can get involved in our afterschool program. I email three departments about doing outreach in my program. My odds aren’t bad, because a bunch of them need to demonstrate they are doing outreach as a condition of their grant funding. I had a complicated conversation with my new timesheet supervisor about how comp time works. So un fun. But then I finished blood lesson plan, and titled it “Bloody Fun” and included all sorts of gruesome scenarios about students misbehaving, getting injured, and needing blood transfusions. Bloody fun indeed. I have another epic conversation with the powers that be regarding the teacher drama at the school. Draaaaaaaaaaama. Then I have a lengthy conversation about a discrepancy in the mileage log for a van, then realize I’m talking to the wrong person about the wrong van. Then I talk to the right person about the right van. I think it’s safe to say I do not have a future job in transportation logistics. For my own context, I decide to take a little time to research the statistics in the schools my organization serves. Back at my food bank job, I learned to use the state and federal databases showing what percentages schools have of students receiving free or reduced lunch. It’s a useful little measure to help you infer a school’s level of poverty, or at least relative poverty. Now, this list is pretty funny. A few coworkers and I had gotten into an epic conversation about our favorite scary movies, and decided to commandeer a work projector to have a scary movie night. Meanwhile, a counter contingent of coworkers said that they hated scary movie. I imagine they were involved when I found substantial edits made to my movie list. And thus the day concludes. 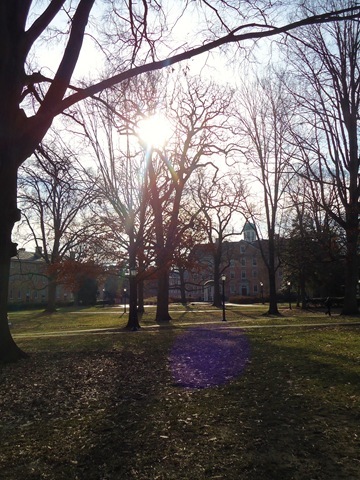 When the weather is nice enough (which in North Carolina it is an awful lot) I like to walk home from work. This particular day wasn’t all that jazzy, and I had my boyfriend asking me to a fun night out at one of my favorite places to grab a bite. Pull my leg why dontcha. 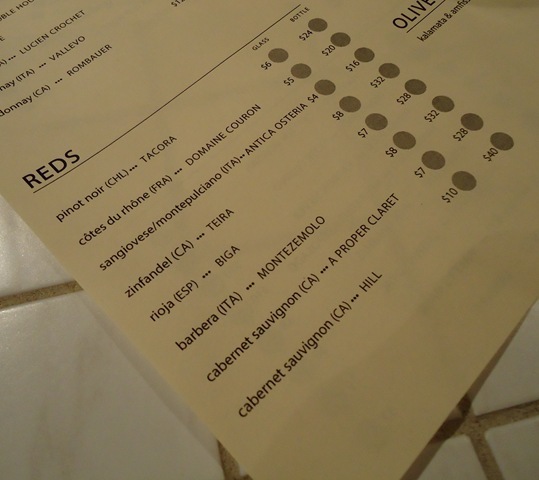 Started with a fun glass of vino. … how cute it is! 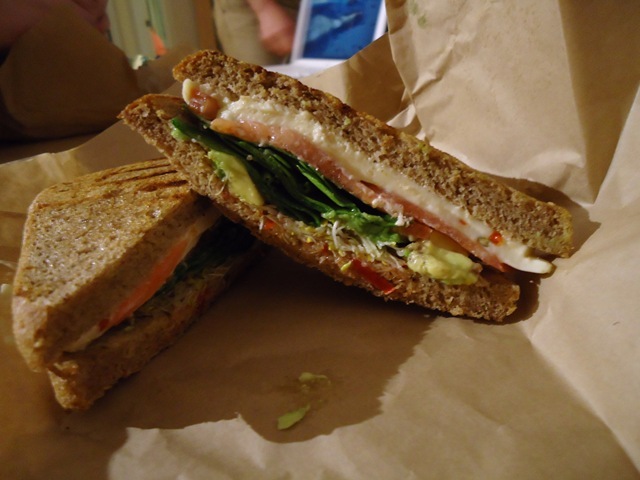 Tru makes totally customizable sandwiches- you check off whatever you want and pay per item. The crazy thing- ANY VEGETABLE is 25 cents- whether you get light, medium, or heavy servings. AND THIS INCLUDES AVOCADO. This makes me exceedingly happy. Anyway, I was fantasizing about my avocado packed sandwich, waiting patiently, and it was taking forevvvvvvvvvver. 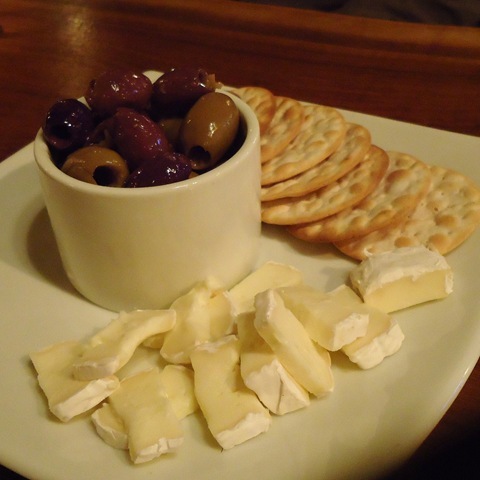 So my hero Steve ordered us some brie and olives. 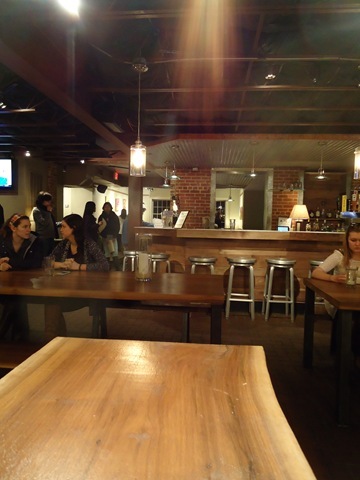 And then… after waiting an HOUR AND A HALF (giving them some leeway because there was a private event going on) we realized they had lost our orders. 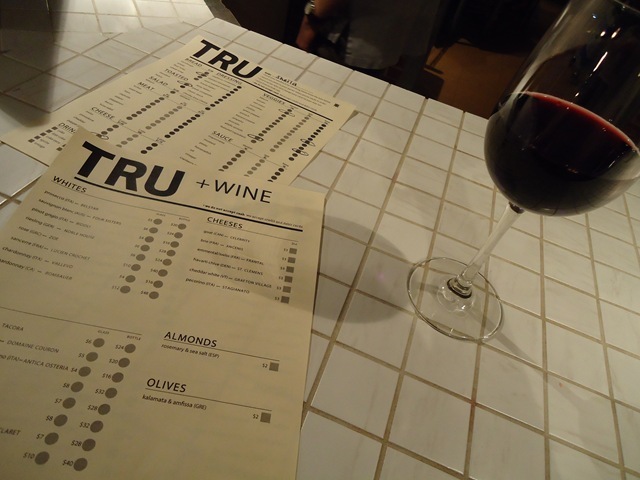 They redeemed themselves by giving us everything on the house (including the cheese and wine, which I thought was pretty classy) but we had a bad taste in our mouth (haha!) so we took our sandwiches to go. Let the record state, this is still a fabulous sandwich. Something amazing happened to me on Friday: I got my acceptance letter from the University of North Carolina School of Public Health. I cannot. Freaking. Believe it. I think about my mediocre math GRE (and the fact that the score was two years old when I submitted it), I think about my (only) good (not great) college and (only) good (not great) GPA, I think about the fact that I took my hard science prerequisites at community college, and I go, WHY ON EARTH WOULD THE SECOND BEST PUBLIC HEALTH PROGRAM IN THE ENTIRE COUNTRY (ranked higher than Harvard!) accept me?!?!?! The good news is that I feel that amazing feeling inside- a feeling many wise people have described to me, everyone from my mother to my friend of ten years Andrea, with whom I shared tea and celebration today- the feeling of looking back and seeing all of the little steps that you took in your life that you weren’t sure about as they were happening suddenly revealing themselves to’ve all led you here. Still, there’s a feeling of not-good-enough-itis that I’ve had lingering in me my whole adult life. There are few matters in this world in which I truly feel confident in my abilities. Cooking is one, but it’s all pretty objective to me (following a recipe and/or inventing something with a lot of cheese is not difficult). Being a good listener is another, but to me being a good listener is incredibly easy because all you have to do is sit there and people tell you fascinating and salacious details about their lives. I finally seem to’ve beaten not-thin-enough-itis, though it occasionally has a little flare up. But the big things, man? Being good at a job, feeling confident? That is really hard! I heard off the record at a work happy hour that 50 people applied for my job. While someone with healthy self esteem might go, “Go me! I must be well qualified and interview well!”, I went, “OH MY GOD I BET THEY ARE ALREADY REGRETTING HIRING ME!” And interpersonal relationships in the workplace, blecch. I am almost as preoccupied with getting people to like me at work as I am in the rest of my life. But that, the desire to be liked, I think has motivated the vast majority of my life’s decision making. I have, as most of you who’ve made the transition from the old to new blog have figured out, left my previous Americorps position in Durham. 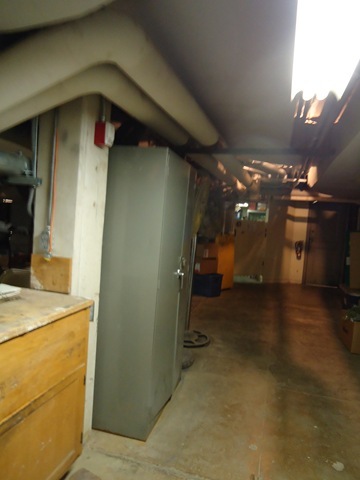 Lots of things went down there, some of which I’m not able to discuss without compromising some families’ privacy. But truthfully, even with the psycho-crazy director at one of the sites, even with the pitiful money, what truly dragged me out the door of that job in which I could see myself making a difference, see myself effecting change, what did me in was feeling like none of my immediate coworkers liked me. In my friendships and romantic relationships, without going into a lot of detail, I get scared that there are underlying things in me- insensitivity, bossiness, yadda yadda- that are inherently unlikeable. Anyway, the journey here, to school acceptance, has been far from linear. Crazy jobs, a crazy journey with mental and physical health. And yet, I feel the need to get some self esteem together. If nothing else, feeling good about myself seems necessary as a measure of gratitude to all the wonderful people who got me here. My godmother, who inspired me to be an RD someday. My mom, who has never told me what to do or pressured me to do something or really even suggested anything. The really really good shrink who got me out of a scary cycle in my life. Steve, who takes me out of my comfort zone to go adventuring and who’s done his absolute best to handle the transition to North Carolina (my big idea!) and the little dramas I’ve brought with grace. The roommate I found on Craigslist who’s turned out to be a great friend. I have a job that is an absolute blessing- it shocks me how much I enjoy the material of my work and the company of my coworkers. And I got into the school of my dreams. Is this the closest one can get to a cure for the not good enoughs? A sustained period of looking out at success around you? Gratitude to God for giving you all of this, and a need to do good with it? My dear friend Andrea, who does a lot of opera singing and a lot of babysitting, introduced me to this clip, which she shows to children and dies laughing at herself. I challenge you to not love it. Listening to show tunes on Pandora. My coworker (who has a lovely voice) has a tendency to play things like “People Will Say We’re in Love” on her headphones and adorably sing along. It made me realize that I would probably enjoy a showtunes Pandora station and- yep! I do! Slight sidenote: I saw the 2009 revival of West Side Story when they were previewing it in DC, and it was amazing. I loved that they added Spanish, and thought the use of a different language completely revitalized songs I was otherwise not nuts about (I Feel Pretty, A Boy Like That). I thought Josefina Scaglione was an absolute revelation as Maria. And Anita was awesome too. The only thing I didn’t love was their semi-bizarre reinterpretation of Somewhere as a solo sang by a little boy who I guess was supposed to be, like, their future child? Didn’t care for it. My all time favorite is Tonight, which is stuck in my head right now. This is the kind of joy you get when you listen to show tunes while working. The other sidebar is that my mother, even like just after she got divorced and I’m sure only had so much in the old discretionary budget, took me and my sister to see plays and musicals. For this, I am eternally grateful. And we both got good SAT scores, so the investment was worth it! On the fitness front, remember how hula hooping was an event in our Olympics party? Well… I still have two hula hoops in my apartment! I have taken to coming home from work, putting on some jams, and hula hooping, sometimes alone and sometimes with a friend. It is super fun and relaxing and I have a sneaking suspicion it will someday give me abs of steel. If so, I will write a book entitled Eat Whatever You Want and Exercise When You Feel Like It and Do Some Hula Hooping When You Get Home From Work and Be Really Hot. Another fun thing I recommend doing is taking day trips. 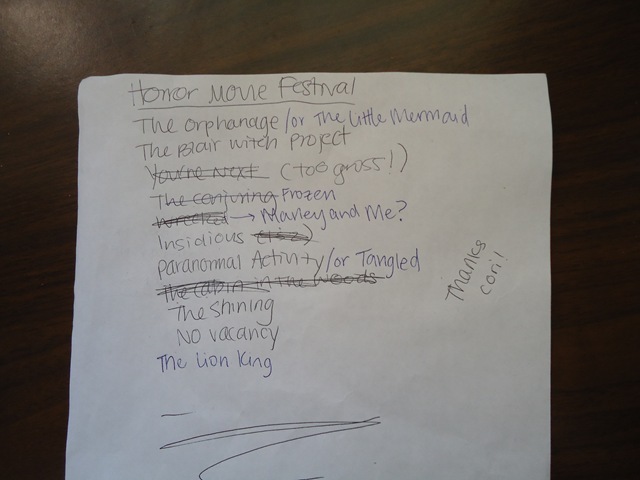 The other weekend, the weather was too iffy for hiking or other outdoor pursuits, but my boyfriend and I were bored with the usual scene and didn’t just want to watch movies all day. 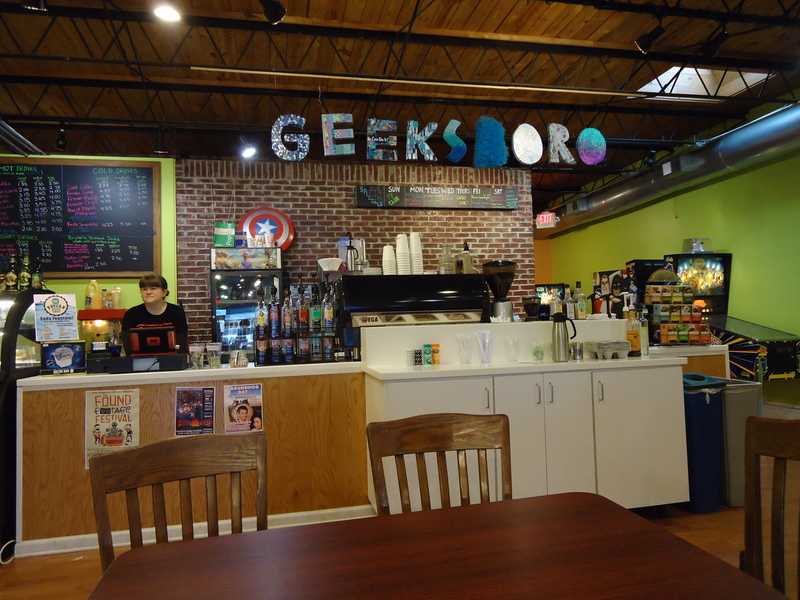 And then, awesomely, we came up with the same idea, and drove to Greensboro. 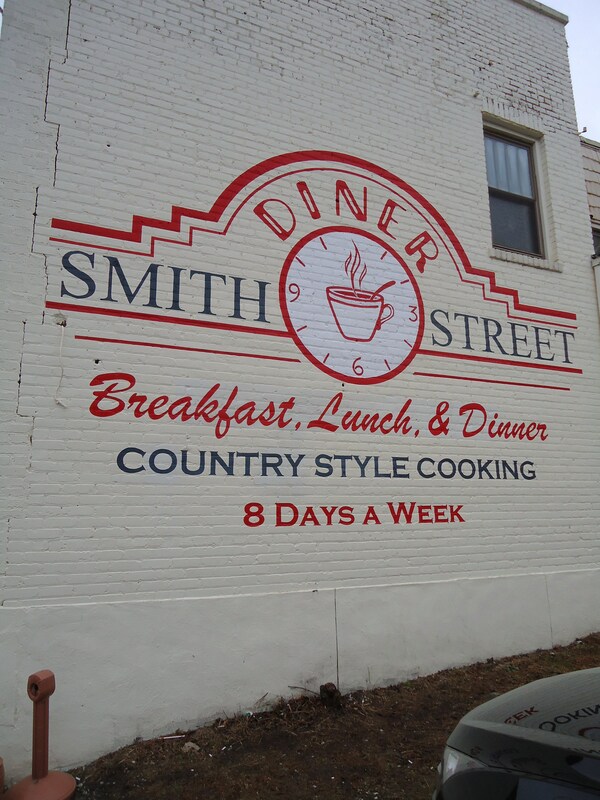 Naturally, our first stop was brunch, at a place thoroughly raved about on Yelp. 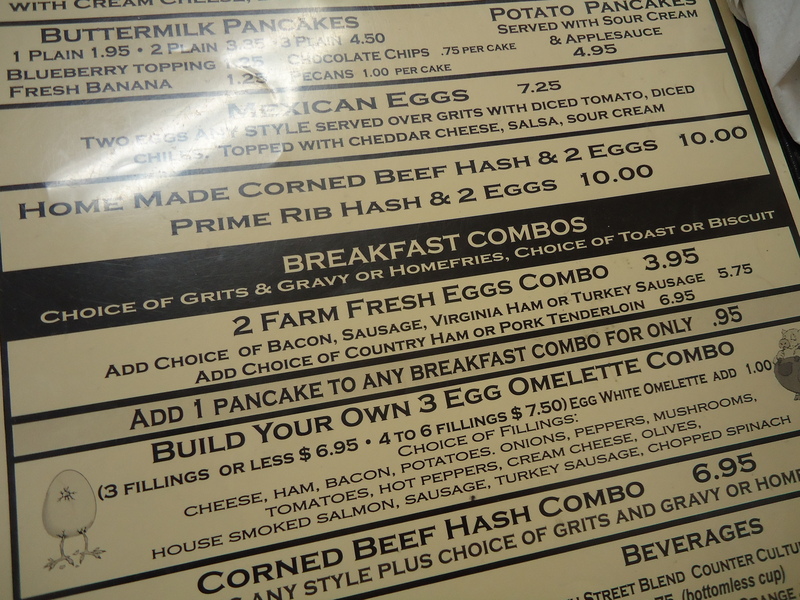 We both opted for the 2 Farm Fresh Eggs combo. Affordable much? 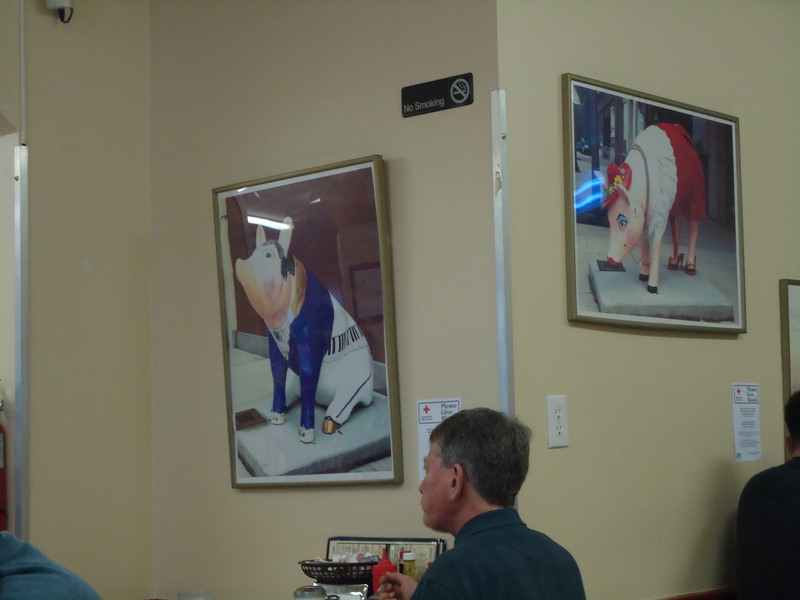 While we excitedly waited for our meals, we admired the pig-themed decor. Fun times. 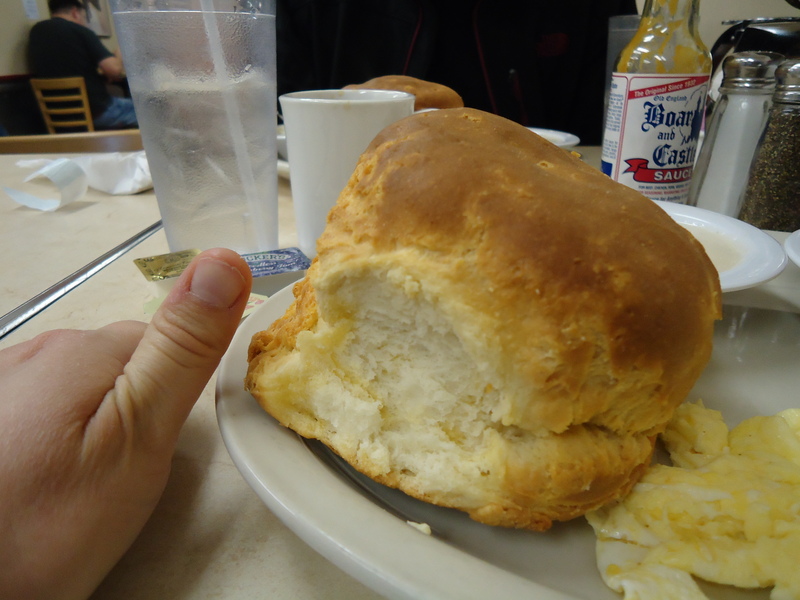 I knew seeing other people’s meals go by that the biscuits were big but HOLY TOLEDO. 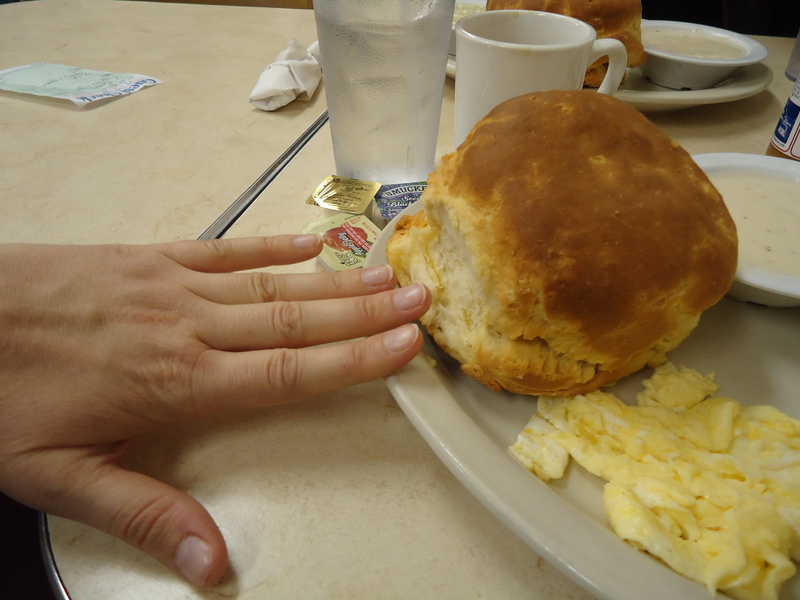 Here are my attempts, using my hand for scale, to convey how absolutely, even ridiculously, enormous this biscuit was. Both for scale and as a reflection of how delicious it looked. 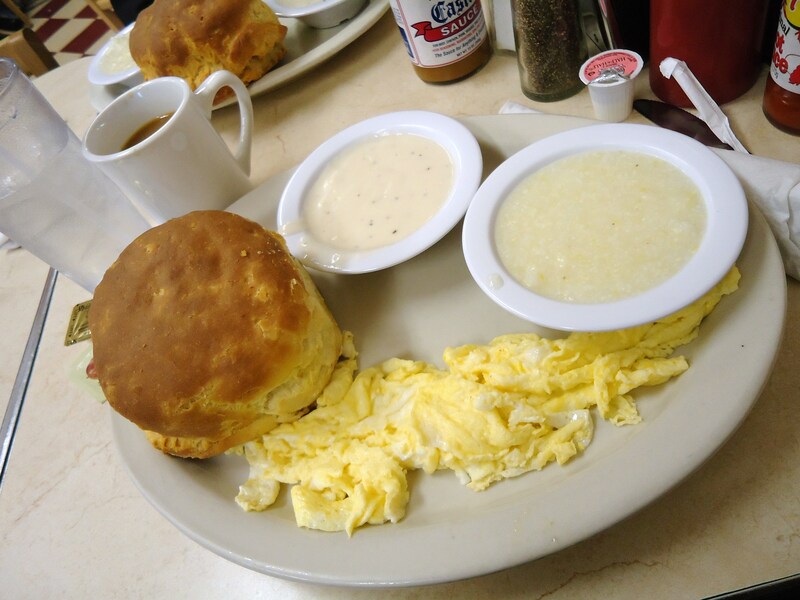 Having such a large canvas on which to work (the eggs and grits weren’t skimpy either) I took advantage of the condiments selection. 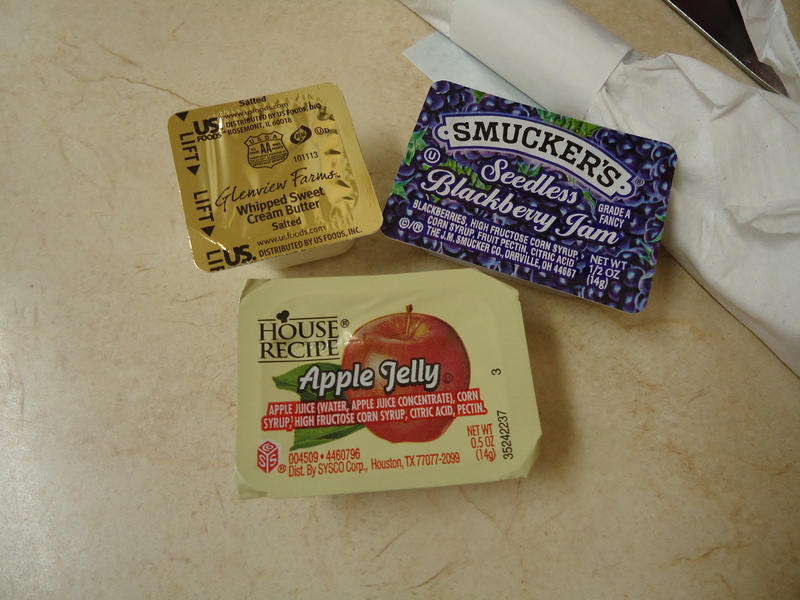 Tip of the hat to Smuckers for not putting high fructose corn syrup into their blackberry jam. 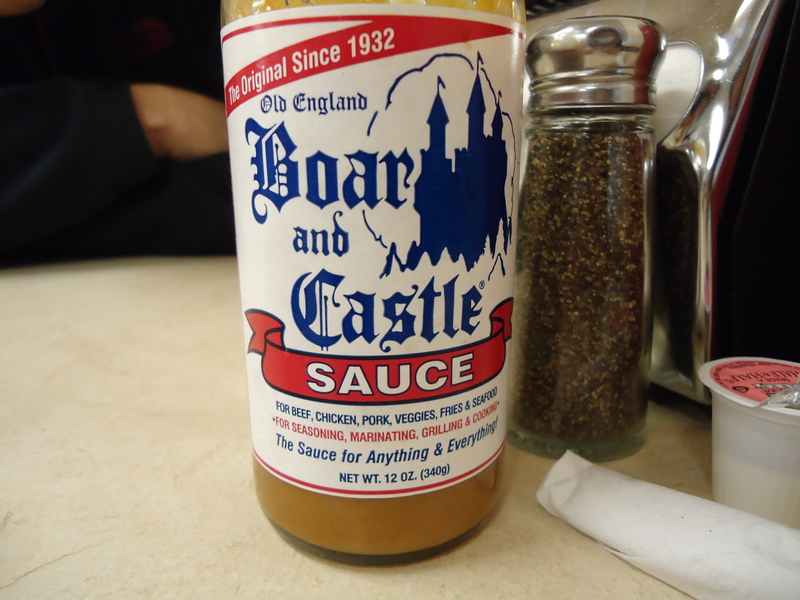 I ended up enjoying that so much that I skipped the apple jelly, though it nonetheless intrigued me. 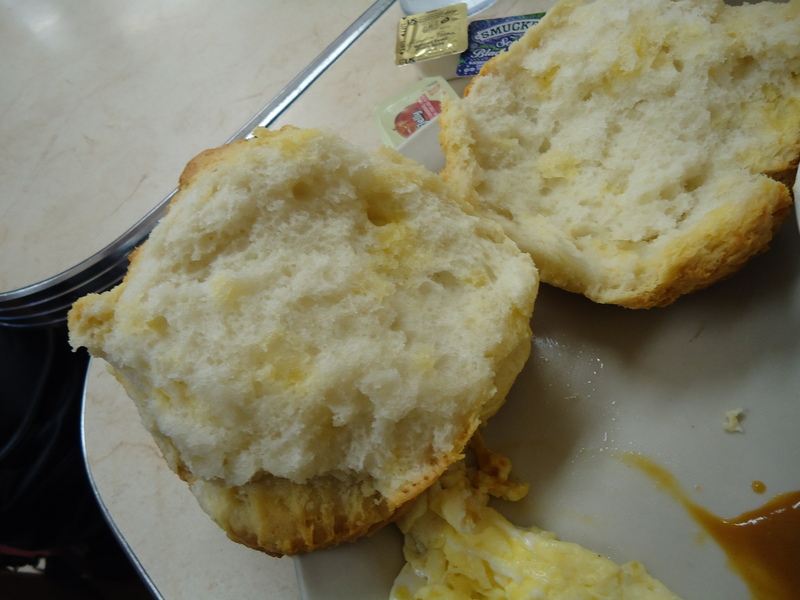 I also didn’t bother with the butter, since this is an unedited photo of the biscuit when I ripped it open. Yeah, butter flecks much? 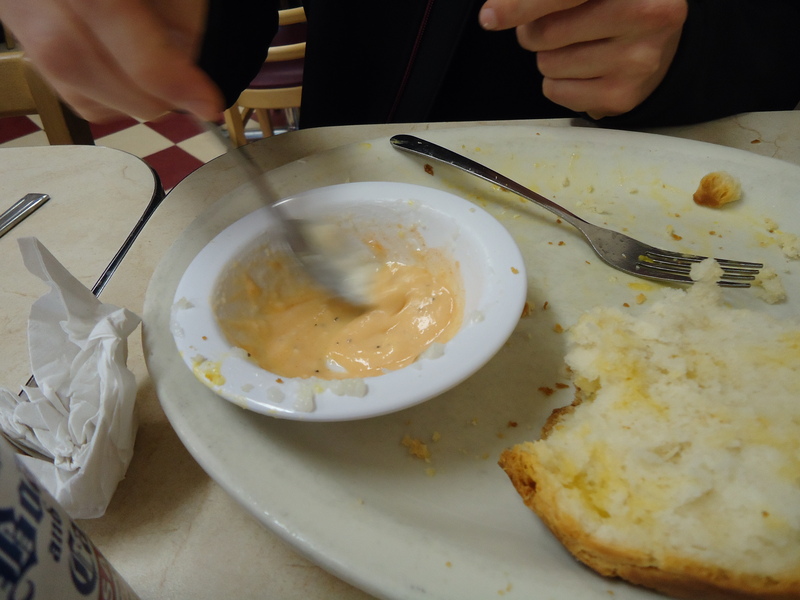 As for the eggs, I had to try this sauce with them. 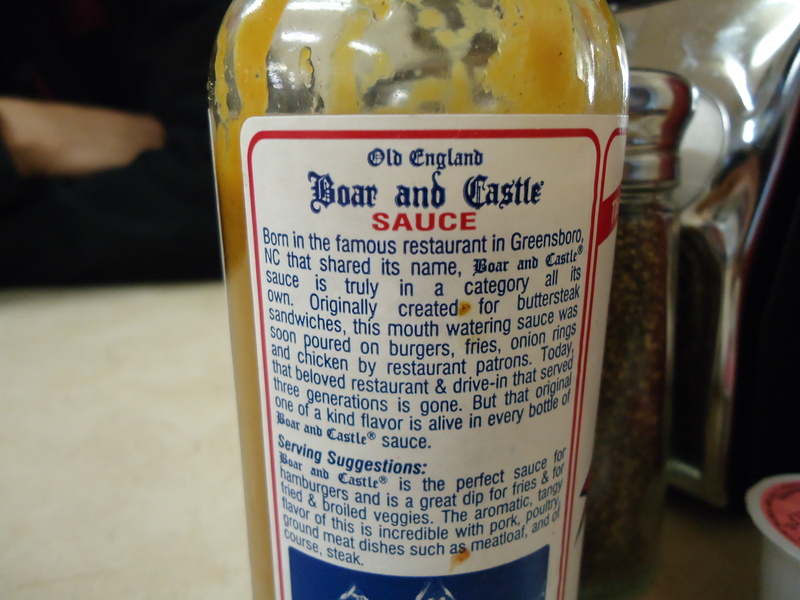 Because, as I read on its label, despite saying “Old England” at the top, despite having a castle on it, it was in fact invented right here in Greensboro. It was pleasantly tangy with the eggs. 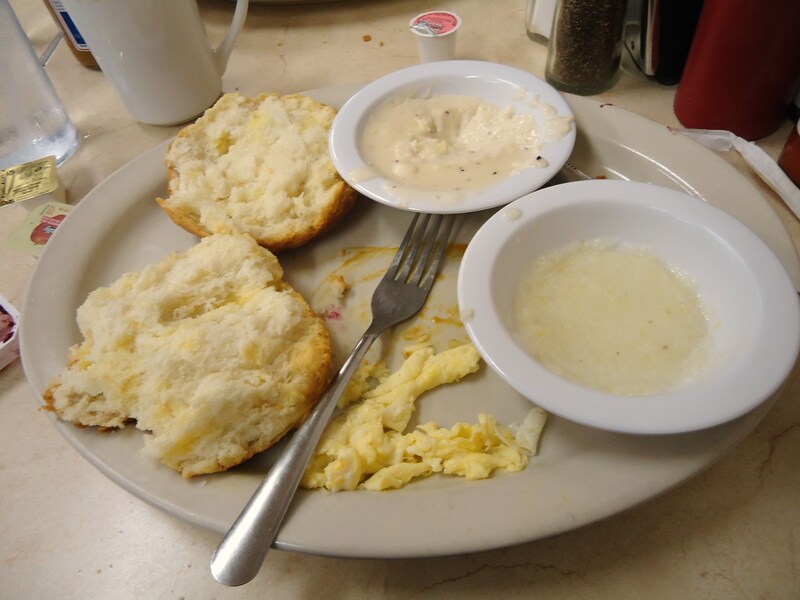 Steve tried mixing it with his sausage gravy with his biscuit… yeah, not so much. He’s an innovator, though. At the conclusion of the meal, this is what my plate looked like. yes, I know it appears that I did not really eat anything. That is a reflection of portion size, believe me. Understand that I waddled out of the restaurant with what I did fit in my stomach. 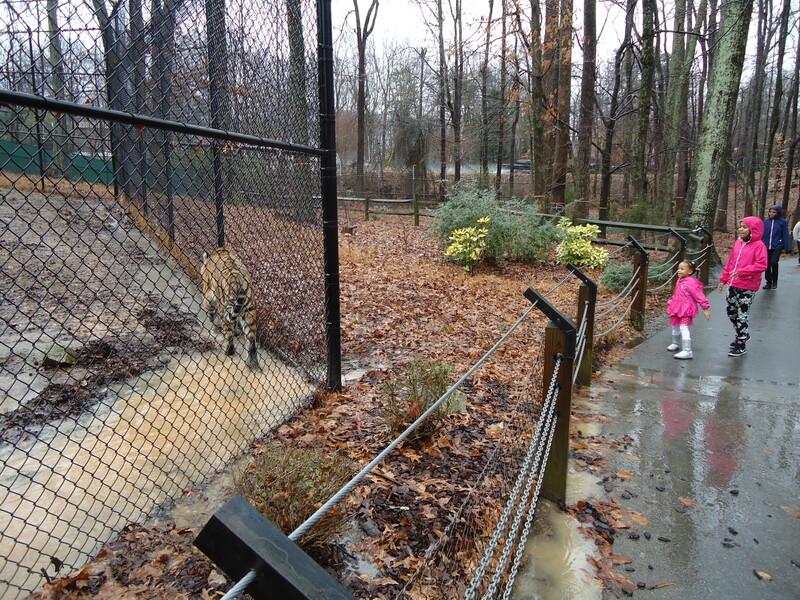 Next on the agenda was the Greensboro Science Center. It was a blast. Were there adorable otters? Yes, there sure were. Did we get to watch their educational enrichment for the day? Yes, we sure did. The keepers put mealworms inside of hollow gourds for them and the otters had a blast. There was also a two headed turtle. CRAZY! I have mixed feelings about zoos, but think it is safe to say that this guy would not have had the most fun in the wild. They named both heads, Gem and Ini (get it?). Apparently they had dueling personalities. Let’s all pause for a moment and think about how the world would be if we had to share a body with our siblings. 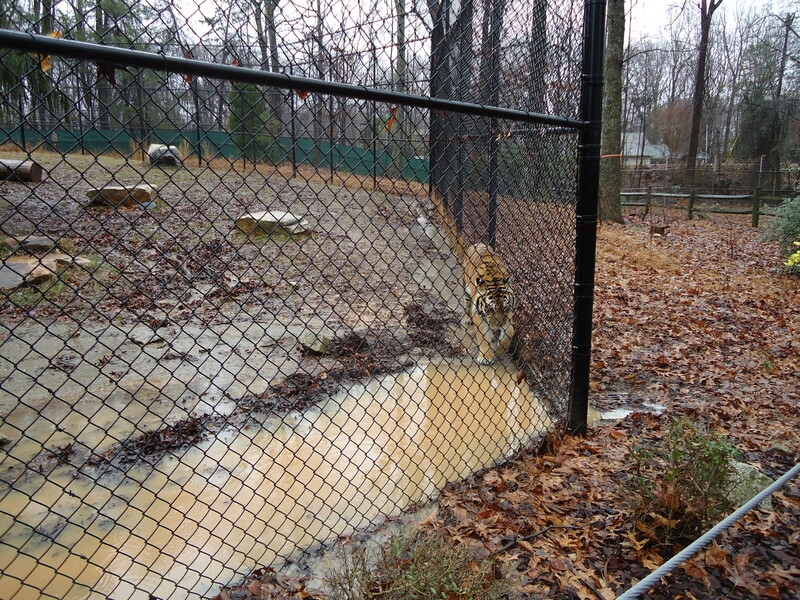 By far the best part of the day for me was seeing the tigers. I had never in my life been this close to a tiger before. The tigers were freaking BEAUTIFUL! Gorgeously muscled bodies, expressive faces. I’m actually seeing more tigers today, but that will be another post. On our way out of town we saw the name of this establishment and decided we had to stop there. It was the CUTEST! 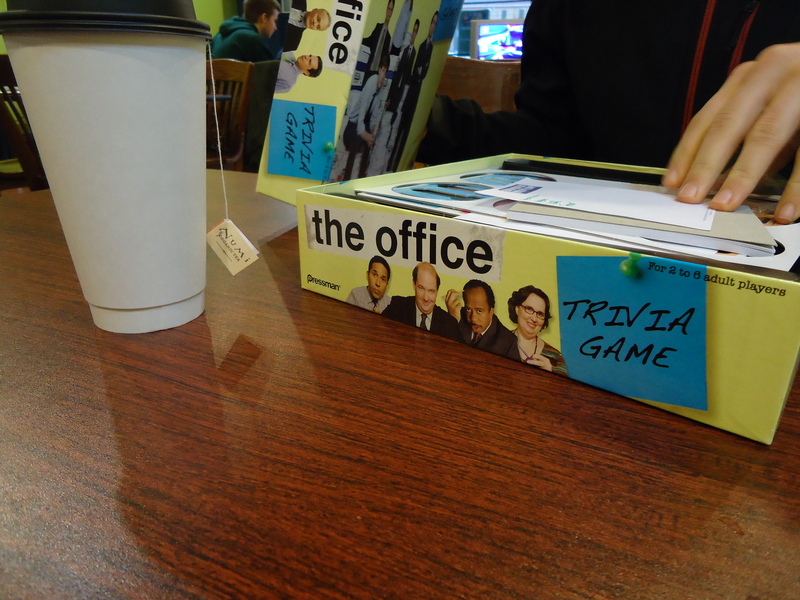 They had a siiiiiiizeable selection of board games, but we decided this one was a must. I also got some really good fair trade tea to enjoy during my board game. 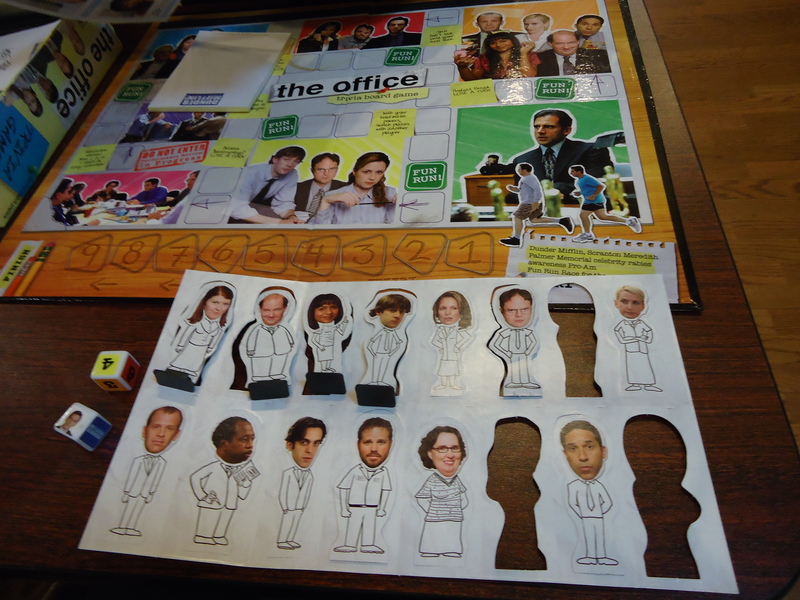 I was initially aghast when their character cutouts didn’t include Creed, my favorite. But then victory! We found him! 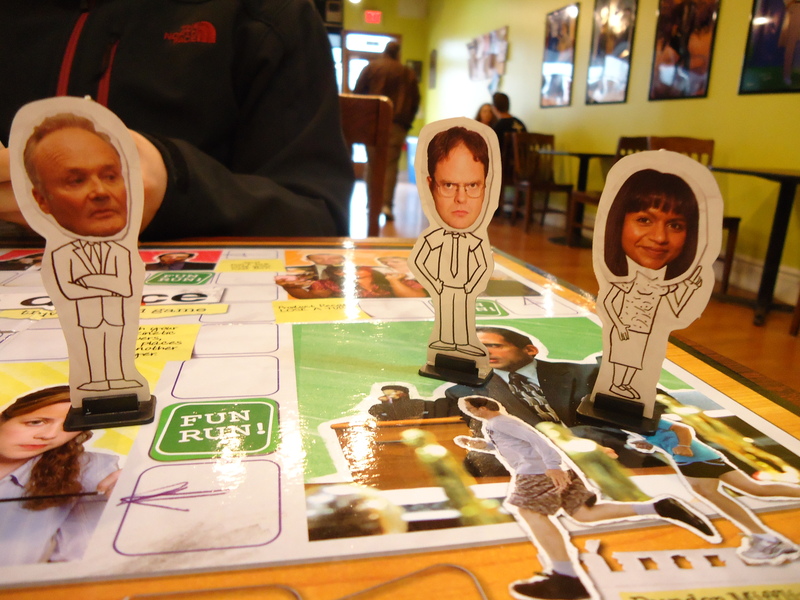 Steve had already said he was Dwight, though, and I thought it would be slightly weird if we were both “playing” dudes. So I had to choose between Creed and Kelly. Anyway, after all the buildup, the game was pretty baffling to understand, and our parking space was only supposed to be for 15 minutes. So we didn’t stay that long, but it made for a delightful change of scenery.